The bathroom is one of the most used rooms in a home, but bathrooms, especially in older homes, are often small and cramped. Ceiling lights, painting techniques, decorative mirrors, porcelain tile, and effective use of space and storage can help the room seem larger and airier. 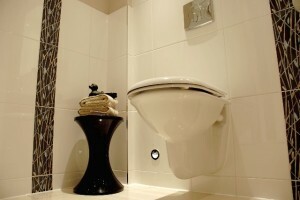 There are several factors to consider when exploring bathroom design ideas for a small bathroom. Is it a master bath, or a half-bath, or is it the only bathroom in the home? 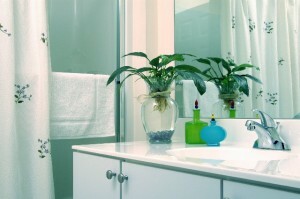 Do you want an adult bathroom with a spa-like atmosphere, or a family-friendly bathroom? Start by making a list of the facilities that are important to you and your family, but keep in mind the resale value of your home. You might find a shower stall more convenient and space-saving than a full-length tub, but lack of a tub may lower the value of your home. Many women enjoy the luxury of soaking in a hot tub, and families usually want a tub for bathing young children. A good compromise would be to install an Asian-style tub, which is deeper, but shorter, than a regulation bathtub. The space saved could then be used for a shower stall, or a tall cabinet for storage. Like full-sized tubs, Asian tubs are available with extras such as whirlpool jets, and showerheads, either hand-held or installed. When installing a shower, choose a curved stall of clear or frosted glass to help increase the visual space. Toilets also come in space-saving sizes and designs. 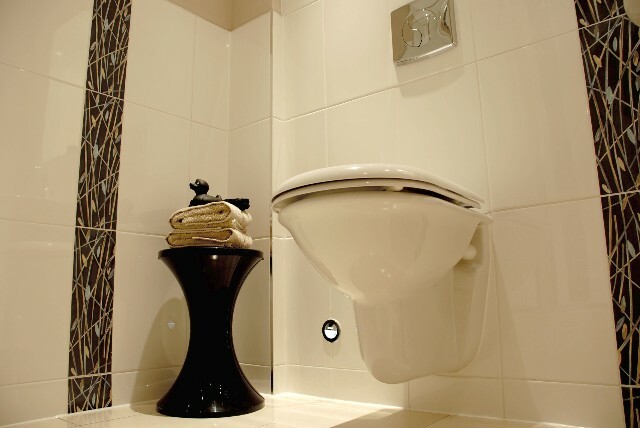 A wall hung toilet takes up less visual space than a floor mounted unit. A round bowl uses less actual space than an elongated one. To save additional space, the water box can be mounted within the wall, or into an existing cupboard. Effective use of light is one of the best ways to make a small bathroom seem larger. If your bathroom has a window, consider doing away with curtains or blinds, and replace the glass with a frosted pane which will let in light while maintaining privacy. Frosted adhesive panels are also an inexpensive solution. Another idea is to hang a simple, straight, curtain about one-third of the way down the window, which lets in light, but still allows you to “dress” the window. The bathroom door can be a great source of natural light. Consider using a door with either a full or half-pane of frosted glass. These come in many attractive designs. The door can also be installed as a pocket-door, rather than wasting valuable floor space with a traditional hinged door. While many designers feel that lights mounted on the sides of the vanity mirror, or across the top, are the most desirable, these can cause shadows and dark corners. Ceiling lights cast a more even light, and are readily available in a variety of styles to complement your chosen décor. There are many choices in vanities, from the traditional white to the “furniture” look. Purchasing a small bureau or sideboard from a second-hand store and installing a drop-in or vessel sink allows you to express your personality, and give you the custom-built look you may desire. You can couple this with a wall-mounted faucet, another space-saving measure. While many homeowners prefer a vanity cabinet because of the storage capability, these do take up more space than a pedestal sink. Pedestal sinks are available in many models. Some are equipped with extra wide tops which leaves room for soap dishes and toothbrush holders, as well as towel bars on both sides. Designers suggest using pale colors in a small room, which generally gives an airier feeling to the room. Pale blue or aqua can lend a beach or spa-like feel to a room. If you prefer bolder colors such as teal or burnt orange, use them. Try faux painting techniques such as ragging, glazes or washes. These give texture and interest to the walls without a lot of frilly detail. 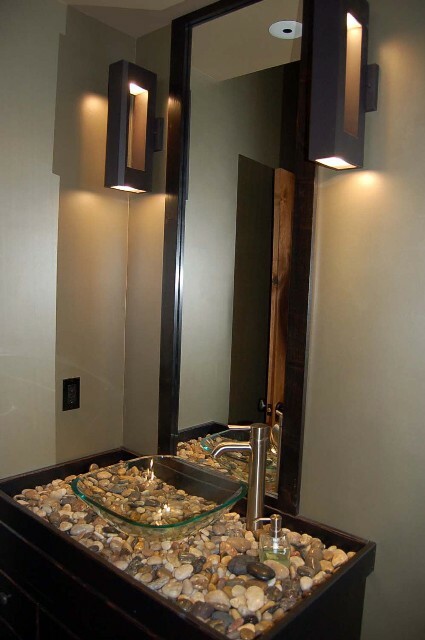 These type of ideas for decorating a small bathroom like a spa will really make a difference in your bath. Porcelain tile, which has a luminous quality, can be used for walls or floor, and comes in a variety of colors. Using grout in the same color as the tile helps enlarge the space. Purchase one large bathroom mat in the same color as the floor, rather than several smaller mats, or different shades. This helps to visually unify and enlarge the floor.